Microsoft Forefront is a comprehensive suite of security products that will provide companies with multiple layers of defense against threats. Computer and Network Security is a paramount issue for companies in the global marketplace. Businesses can no longer afford for their systems to go down because of viruses, malware, bugs, trojans, or other attacks. 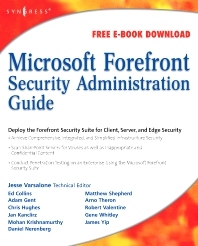 Running a Microsoft Forefront Suite within your environment brings many different benefits. Forefront allows you to achieve comprehensive, integrated, and simplified infrastructure security. This comprehensive suite of tools provides end-to-end security stretching from Web servers back to the desktop. This book will provide system administrators familiar with Syngress' existing Microsoft networking and security titles with a complete reference to Microsoft's flagship security products. First book to address securing an entire Microsoft network from Web servers all the way back to the desktop. Companion Web site provides best practices checklists for securing Microsoft operating systems, applications, servers, and databases. Companion Web site provides special chapter on designing and implementing a disaster recover plan for a Microsoft network. Network administrators, security professionals, Webmasters, and database administrators responsible for administering and securing Microsoft networks, operating systems, applications, mail server, Web servers, firewalls, and databases. Jesse Varsalone is a Cisco Certified Academy Instructor and holds the CCNA certification. Jesse is also a CISSP, MCT, MCSE, and currently works as a Computer Forensics Senior Professional.